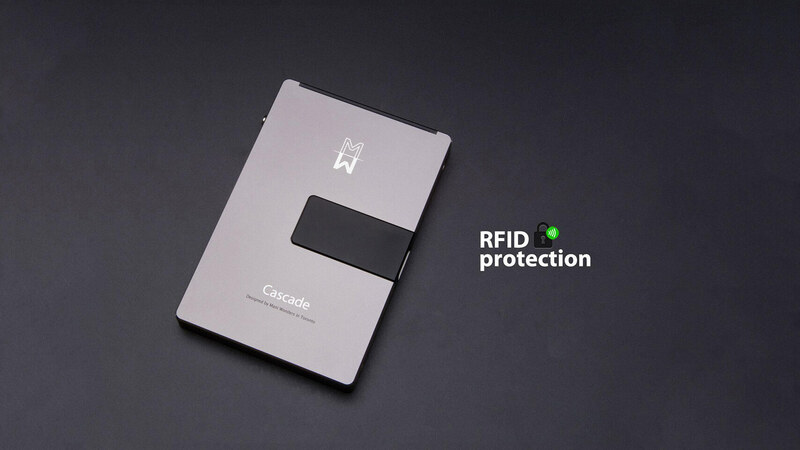 Cascade Wallet smart wallet pop up automatically when you use a credit card, can not be wireless identity theft. Cascade Wallet is a wallet can customization, and is equipped with a removable card ejection function. Cascade Wallet with a one-piece construction, with aluminum as the main material, relatively strong, and durable. There are five kinds of colors for you to choose from. If you still do not feel able to demonstrate enough personality, Cascade Wallet also provide fiber laser engraving, in the above permanent leave your favorite patterns, text, or other things. Cascade Wallet has two main features, one with a card ejection function, by sliding the button, so that your card can automatically pop up, this experience must have like to have not a friend. In addition to all kinds of your card, contact between the spring clip and silicone pad can also be fixed on the back of a business card bills or purse. Cascade Wallet can ensure that your credit card, debit card, ID is not wireless identity theft, which is its second highlight. Anodized aluminum products have a special strength properties, can prevent damage to the wallet card. At the same time such materials can also be used as a “firewall” to prevent unauthorized access and protect your personal and financial information.